The music crackled and the acequias flowed in a lazy sweet rhythm as the car glided by tall rows of corn, clipped clumps of hay, sleek horses, dark pecan forests and sprouting bundles of cotton, in and around Anthony, Berino, La Mesa, San Miguel, San Pablo, and Mesilla. But something was missing, something was very odd that summer day of 2015. Not a single field of chile was readily observed. Decades ago, when this reporter began covering the Paso del Norte borderland, this patch of Dona Ana County was Chile Country. Hundreds of acres of the hot stuff stretched far and wide under the New Mexican sun, filling buckets lugged by seasonal and immigrant workers that soothed the palates of consumers in the Land of Enchantment and far beyond. La Mesa was the scene of the historic 1992 strike by the El Paso-based Border Agricultural Workers Union (UTAF) that demanded better pay and working conditions for the overwhelmingly Mexicano chile pickers. More than two decades later, Carlos Marentes, director of the Border Agricultural Workers Center in El Paso and leader of the ’92 strike, mused about the changing landscape of the once booming New Mexico chile industry. “Consumption isn’t declining, it’s not that people are eating less chile, they’re eating more,” Marentes told Frontera NorteSur. The difference between now and then, he says, rests with the increased globalization of the chile industry as well as the greater role of financial and speculative capital in the world economy. Just as the Florida orange is but one ingredient of a global industry, so is New Mexico chile, according to the longtime farm labor activist. Visually, change is evident in places like the New Mexico-Texas border town of La Union, where Marentes says big houses have replaced old chile fields. Priscilla Garcia, program assistant for the La Semilla Food Center Community Farm in Anthony, also has noticed “a large change” in local land usage during the past 15 years or so, with more parcels developed for housing or simply left untilled. In 1992, the year before the North American Free Trade Agreement (NAFTA) was approved, 34,500 acres of chile were harvested in New Mexico. That harvest remains the high point for a crop that is not only an economic driver but a cultural icon of the Land of Enchantment. Since then, it’s been mostly downhill for chile. The decline was especially notable during the drought-worn, post-2009 years, when less than 10,000 acres were annually harvested. The stunning news that 2013’s harvest of 8,600 acres was the lowest since 1973 was beat out a year later when only 7,700 acres of peppers were pulled from the New Mexican land. Tagged at $38, 695,000, the farm-gate value of the 2014 crop was much lower than in 2013 when chile earned state farmers $49.5 million; in 2012 chile fetched growers $65.4 million, according to the U.S. Department of Agriculture’s National Agriculture Statistics Service. Chile Industry participants and observers cite many reasons for the misfortunes of the New Mexico chile pepper, including drought, plant diseases and pest infestations, underhanded competition from sellers of fake New Mexico chile, and labor shortages caused by restrictive immigration policies. But a primary reason goes by five fat letters-NAFTA- as well as other free-trade inspired agreements with chile-producing nations that have far lower labor costs and less environmental controls. For instance, New Mexico Business Weekly cited United States Department of Agriculture statistics several years ago in reporting that U.S. chile pepper imports soared from 417 million pounds in 1999 to more than one billion pounds by 2008. Back in the days of the Great Chile Boom, some old timers and insiders suggested that the state industry had gotten too big too fast, evoking a wasteful monoculture, and was burning up lands that should be carefully rotated with different crops. Now, however, the trend has arguably gone in the opposite extreme. Chile hounds searching for the vaunted pepper will still have better luck in the Hatch Valley straddling Dona Ana and Sierra counties north of Las Cruces. As the August harvest picked up, a valley nourished by the Rio Grande bustled with workers dumping hand-picked pods into field crates, trucks hauling chile to packers and processors and metal roasters scenting the air with an unmistakable New Mexican aroma. Down valley back roads deep green fields streaked with red beckoned the sun and rain clouds. Located in downtown Hatch, the Atencio family’s Hatch Chile Sales is one center of the action. There shoppers will find fresh sacks of green in the 38-42 lb. range, dried green and chipotle chile, bags of red chile powder and other goodies. On a recent day, a roaster exuding pungent smells kept the ambiance true to the season. A couple from California, Raul and Norma Martinez, loaded the bed of a pickup and a small U-Haul trailer with dozens of sacks of green chile destined for the West Coast. 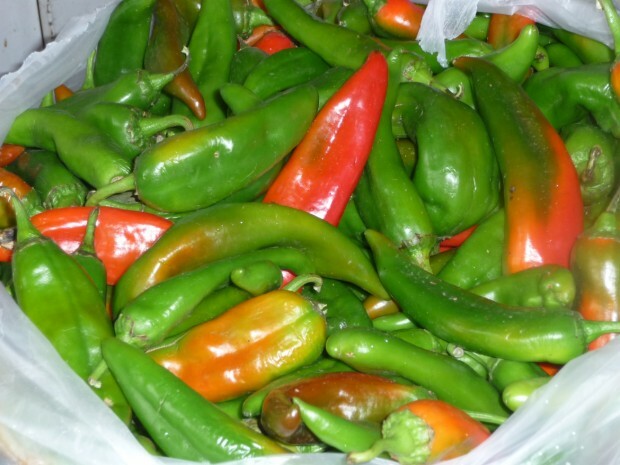 Originally from Silver City, New Mexico, Raul Martinez said the chile was for a “big roasting party” a neighbor was planning in the Golden State. Hatch Chile Sales helper Edward Martinez chimed in, saying his sister and her husband were contemplating a roasting venture this year farther up the coast in the state of Washington. As the émigrés show time and time again, you can take a New Mexican out of New Mexico but you can’t take the chile out of the New Mexican. Now 41, Pete Atencio has grown up with chile. According to the farmer-seller, the number of retail roasting operations in his small town has grown from two in 1986 to 14 today. “Every year we seem to be selling more and more chile,” Atencio said. Raising a “healthy stand” of peppers with “optimum yields” is the perennial challenge, he said. Atencio has not seen one of the experimental green chile harvesting machines that some view as a solution to labor issues. “Is there such a thing as a green chile picking machine?” he asked the reporter. While the New Mexico chile industry is merely one cog in a global chile machine run by international trade regimes, it is nevertheless a local and regional endeavor whose future survival might be found in the direct farmer to consumer exchanges at places like Hatch Chile Sales or in other niche markets. Geographically, Gilbert “Gilly” Pino has carved out an enviable spot on the edge of Hatch. The 66-year-old’s Hatch Valley Chile Company is the first business on the right travelers see when descending into the town from Interstate 25. Rhyming with “Gilly”, the self-proclaimed “King of Chile” does not grow chile himself but specializes in peddling salsa and dried peppers, hawking fresh produce and of course, roasting green chile. Dripping with ideas, Pino plans to open a taco bar-style restaurant soon at his storefront, which is located near the willows of the Rio Grande and across from a cotton field. A folksy man who raises peacocks, spouts racy jokes and hangs a R.C. Gorman painting and other colorful potpourri on his store’s walls, Pino is from a big northern New Mexico family that wound up in Hatch decades ago because of the railroad, a career path he followed his father in pursuing . “Who would want to quit a $50 per hour job to go into chile?” Pino quipped with a grin. In a lengthy conversation with FNS, Pino waxed philosophical about religion, delved into family history, detailed the differences between Arizona and New Mexico chiles and assessed the latest varieties coming onto the market. Hatch’s chile king was outspoken on a matter that stirred controversy in the Land of Enchantment this summer: Whole Foods, the corporate natural foods giant that was recently in trouble for systematically overcharging customers, announced it will use Colorado-grown chile for a good portion of its store sales. In New Mexico, chile always brings surprises. While more water has been available to farmers this year in comparison with the past several ones, the changing climate appears to be playing other tricks. This year some growers are watching their green chile turn a mature red earlier than usual, a phenomenon that is causing problems in the harvest schedule. La Semilla’s Community Farm in Anthony also experienced an early-maturing crop. “We can’t wait for (green chile) to get bigger because it’s turning red,” La Semilla Food Center co-founder Cristina Dominguez-Eshelman told FNS while she staffed her organization’s sales booth on a Saturday morning at El Paso’s Downtown Artist and Farmers Market in Union Plaza. “We would leave them on longer in hopes they would get bigger, but they would turn red,” she said. Since green chile usually provides two pickings, an early stand of red translates threatens income for growers and workers . FNS contacted Jeff Anderson, agronomy and horticulture agent for the Dona Ana County Cooperative Extension Service, for insights on the early red crop. Anderson said he had not yet heard about the problem, but did not doubt that early ripening was occurring. Anderson said he would need to consult with New Mexico State University’s vegetable specialist for more precise information about the early maturing in chile, but added that hotter weather could produce plant stress and early ripening. Another reason could be from not enough fertility and water in the soil, he said. According to Anderson, southern New Mexico had a late spring followed by a “fast warm-up.” Dona Ana County’s extension agent said the public has an opportunity to ask about early red as well as other chile matters at New Mexico State’s upcoming annual Chile Field Day (see note at the bottom of this article). In so many ways, chile is inextricably linked to New Mexico’s past, present and future-economically, socially, culturally and environmentally. Cristina Dominguez-Eshelman and Priscilla Garcia of the non-profit La Semilla Food Center describe chile as an essential element of biodiversity, a cultural binder of generations and transmitter of values, a potentially resilient adapter to climate change, and a template for labor and food justice issues. The pepper, they said, was the soul food of New Mexico. For La Semilla, chile is one piece of a diversified operation of vegetables and cover crops. “If we only grew chile we couldn’t compete with those large-scale growers,” she said. “We try to be strategic in our decisions. Added Dominguez- Eshelman: “I grew up here and didn’t grow up eating kale.” The Mesilla Valley growers regard chile almost as a “gateway” food that can inspire local interest in other, less familiar foods like kale when mixed into the recipe. Despite the troubles swirling around New Mexico chile, some newcomers to the business are taking the plunge. Oscar Gutierrez, a part-time grower in Anthony, is harvesting his first batch of peppers this year. “I was very satisfied with my crop. It was my better crop this year compared with the sweet corn or squash,” he said. The Anthony farmer expressed pleasure at getting up to five pickings from his crop of New Mexico, poblano and habanero chiles. Gutierrez, who works as the Latin America sales rep for an electronics manufacturer with plants in nearby Ciudad Juarez, acquired land in Anthony six years and began growing alfalfa. He’s now making a transition to organic vegetable farming with the assistance of New Mexico State University. For his first crop, Gutierrez found buyers locally, in Las Cruces and in Santa Fe. “I want to be able to find niche markets and grow what nobody else is growing,” Gutierrez said in a phone interview. As a new chile farmer, Gutierrez said he had “no reference” to judge whether the chile that he planted in April and which started turning red a few weeks ago matured too early. The myriad issues surrounding 21st century New Mexico chile — climate change, water, labor or international economics — symbolize broader issues influencing our place and our time. Next PostLatinos have always cared about the environment — Now it's time to Act!